Hand Reading Mini-Course - Medical Hand Reading: axial triradius, AtD-angle & A-line! Another important aspect of the palm concerns the dermatoglyphic axial triradius - this triradius is usually observed on the ulnar side of the palm near the wrist. 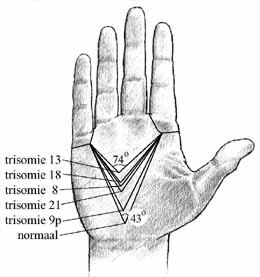 In the hands of people with an 'autosomal trisomy' the axial triradius is usually observed at a higher region of the ulnar side of the palm1-2: see figure B-1. A third palmar aspect with stereotype features concerns the progression of the dermatoglyphic line starting from the palmar triradius below the index finger. In the scientific vocabular this dermatoglyphic line is usually refered as the 'A-line'. 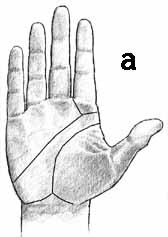 Usually the A-line ends at the ulnar side of the palm (below the little finger): see figure B-2a. However, a high positioned axial triradius is frequently accompagnied with an unusual progress of the A-line directed towards the wrist (figure B-2b) or towards the little finger (figure B-2c). For a high positioned axial triradius appears to 'block' the progress of the A-line towards the ulnar side of the palm. Figure B-2: the relationship between the position of the axial triradius and the A-line. 1 - Schaumann, B. & Alter, M. Dermatoglyphics in Medical Disorders. Springer-Verlag, New York., 1976. 2 - Loesch, D.L. Quantitative Dermatoglyphics: Classification, genetics, and pathology. Oxford Medical Publications, 1983.